This is an alarm clock, that dials many telephone numbers at a specific time each, along with multiple calls and different snooze times for each individual. It also shows a report with a list of all the numbers dialed since start up of the program until the current time, along with the exact time dialed, and the status of how the other party reacted to the call (busy/hung up/no answer, etc.). 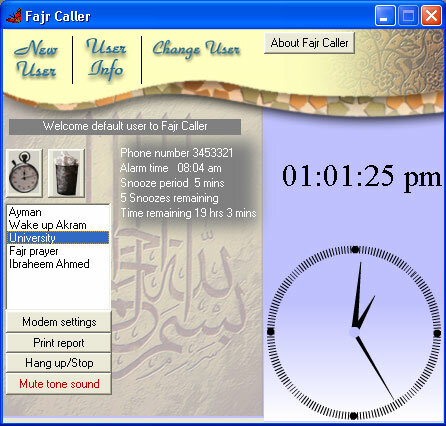 Displays for each telephone number, the time remaining for the next call, and the number of calls remaining. Displays a pop-up MSN-messenger type alert window to inform the user the number that is being dialed. Includes a report, to list all the numbers dialed, along with the time of dial, and the status of the call. Allows many users to use the program, each with a specific username, to specify his own contacts and numbers. Allows users to optionally protect their account with a password. Open the program, and you will see the login window in front of you. Currently there are no users, so you have to create a new user for yourself. Click on "Create new User", and insert a desired username. Note that it is optional to insert a password. The most important thing to do now is to check the modem settings. If you don't know your modem settings then after reading the instructions, make a test run on your own cell number, and play around (mainly with the Comm Port settings) until the program is set correctly to the modem. After logging into your account, you will need to enter the numbers of lazy people to call. Click on the icon with the picture of a watch at the far left of the window. This icon lets you add a new timing. Just simply follow the step by step instructions to program the timing. To modify a certain timing, you simply double click on the specific number among the numbers in the list. A small pop up window will appear allowing you to modify the information. To delete a timing, you simply click on the icon with a picture of a trash can right beside the icon with the picture of a watch. It will give you a warning message. The next morning you will want to know which individuals responded to the phone, and which hung up. This is just for your own interest, or any personal reason. Click on 'print report'. You will notice a minimized notepad document on the taskbar. Maximize it, and have fun. "Just like I did something good to you, free of charge, do something good to someone ELSE"